Whether you’re shopping for a few fun souvenirs or an entire gift list, you’ll find unique bargains and treasures galore in Daytona Beach. The new Tanger Outlets features over 75 of some of the most popular brands and designer outlets. Volusia Mall, located on International Speedway Boulevard, is home to large department stores like Dillard’s and Macy’s along with over 100 shops, restaurants and a food court. ONE DAYTONA is a premier retail, dining and entertainment destination being built across from Daytona International Speedway. Head downtown to the historic Riverfront Shops of Daytona Beach, located on Beach St. (between Bay St. and Orange Ave) where you can ‘shop small’ at locally-owned shops and authentic eateries, as well as enjoy entertainment and attractions. Discover Daytona Beach surf shops in this video! After a day at the beach, head over to the family-friendly Ocean Walk Shoppes and Movies. Located on A1A, next to the historic Bandshell, Ocean Walk offers a vibrant retail center. When it comes to visiting Daytona Beach and the surrounding areas there’s never a shortage of shopping. 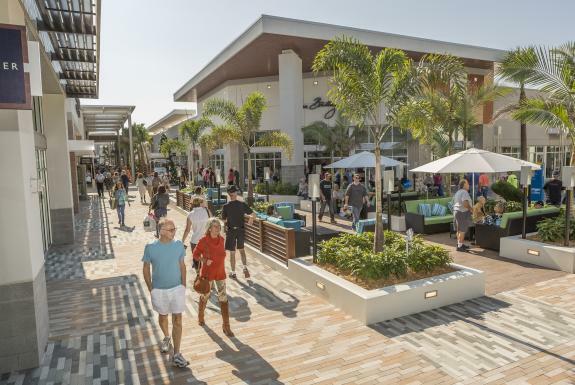 Just south of Daytona Beach is The Pavilion at Port Orange, an open-air-shopping center. Head north to The Trails Shopping Center in Ormond Beach on N. Nova Road and to downtown Ormond Beach on Granada Blvd. offering a variety of unique locally-owned shops and restaurants.